Most PVC strip door curtain materials meet the federal and international requirements for incidental contact with meat, poultry, or dairy. Some of the food grade compliance agencies are (but not limited to): USDA, NSF, FDA, CFIA-ACIA. These compliance agencies normally regulate the following industries: Food processing facilities, Freezer and/or refrigeration storage, Pharmaceutical/Cosmetics Industries and more! Easy access for people, forklifts, carts, etc. 8″ wide (80mil) or 12″ wide (120mil). 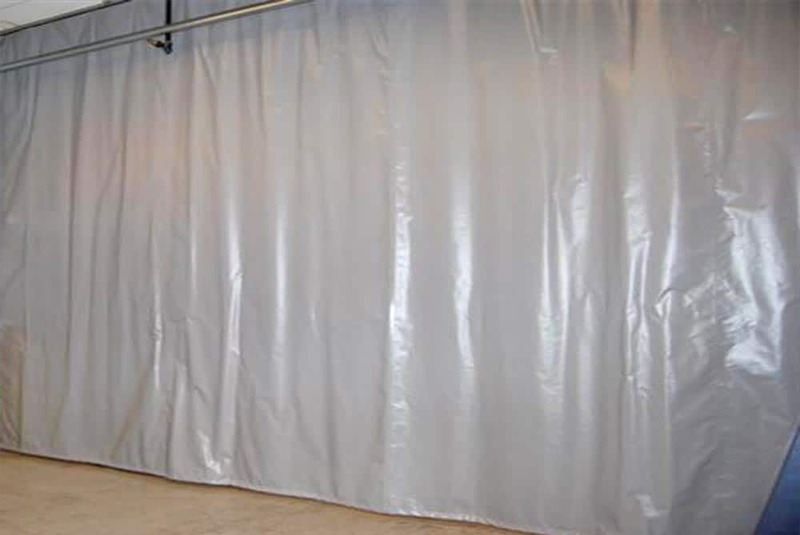 The transparent, flexible PVC strip curtains are economical and meet requirements for incidental contact with meat, poultry, or dairy. 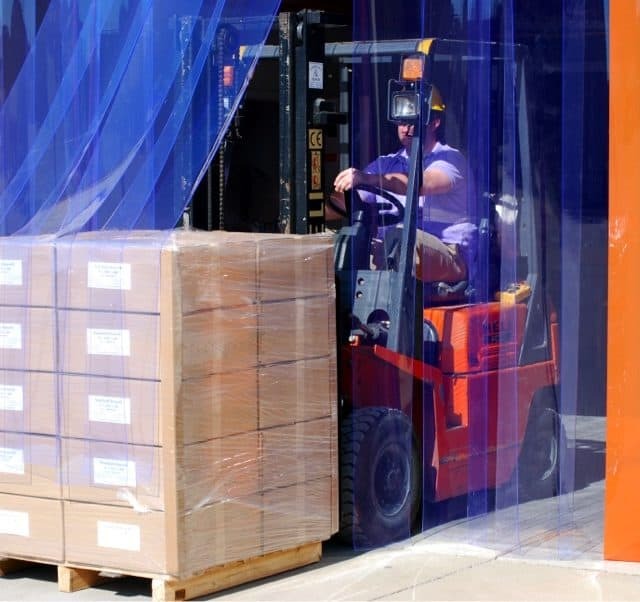 These vinyl strips have protruding wear guards to protect the surface when forklifts or other heavy machinery move through the strip door curtains frequently. PVC vinyl strips are used on outer edges of door opening to inform employees and improve safety. Recommended for outer edge of vinyl strip door curtains with motorized traffic. Welding vinyl strips for strip doors a partial sight barrier against UV and blue-light radiation, specifically for welding applications. Available in red, bronze, and green. OSHA compliant. A PVC strip curtain universal mounting bracket requires an existing frame / structure in order to under mount or wall mount for attachment. This is the most common / straight forward mounting option available for vinyl strip door curtains. 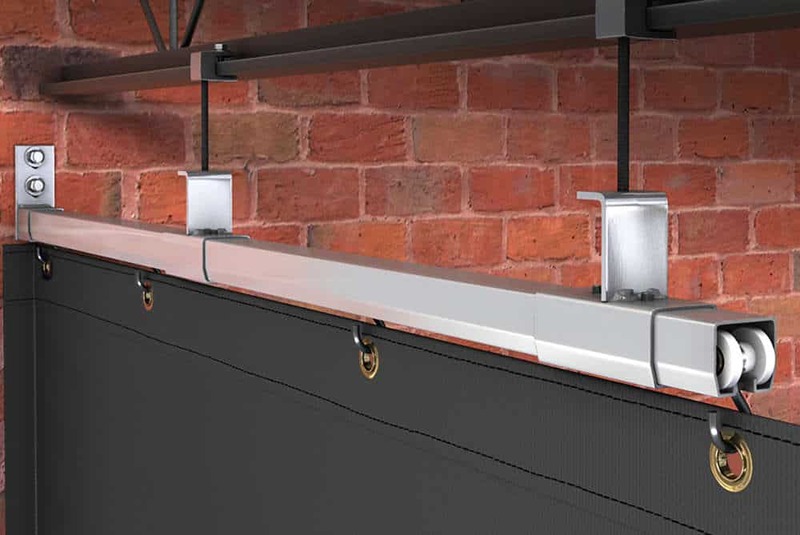 A threaded rod mount for the universal mounting bracket is used when there is a requirement to suspend the vinyl strip curtain from an existing frame / structure that is located a certain distance above the designated strip door area. Suspended Mount: There is a 1″ overlap with the strip door bracket and the PVC strip curtains. Please consider the 1″ overlap when you determine the heights of the strips. Also consider the 1″ floor space clearance needed so the strips do not touch the floor. Our technical representatives are glad to work through the measurements of your situation with you. This option to attach the PVC strip door curtains directly to your AmCraft curtain wall is used in a curtain configuration that does not have an existing frame / door jamb to attach to. This vinyl strip door will attach along the top edge of the opening in the industrial curtain and is retractable along with the curtain – it does not require a universal mounting bracket (for strip doors). We provide you with a hook/loop (Velcro) system to attach the strips that create the vinyl strip curtain opening. It is easily removable and requires simple installation. Vinyl strip doors are ready-to-hang, and flexible PVC strips are used for warehouse entrances, dock doors, distribution / cold storage rooms, as a separation between machine shop and welding areas, and for rooms that require a walk-in arrangement to an isolated area. Our vinyl strip door curtains help maintain temperature control and particle / odor containment while providing easy access to areas that have been sectioned off from other workspaces. Ask us how you can make your workspace more functional and build in the flexibility you require. We can create design layouts and provide options for all your needs! Vinyl strip curtains and PVC strip doors are used for various types of egress and exit requirements. Heavy foot traffic, forklifts, cranes, and automobiles are some of the many types of traffic that a curtain / strip door can be subjected to. 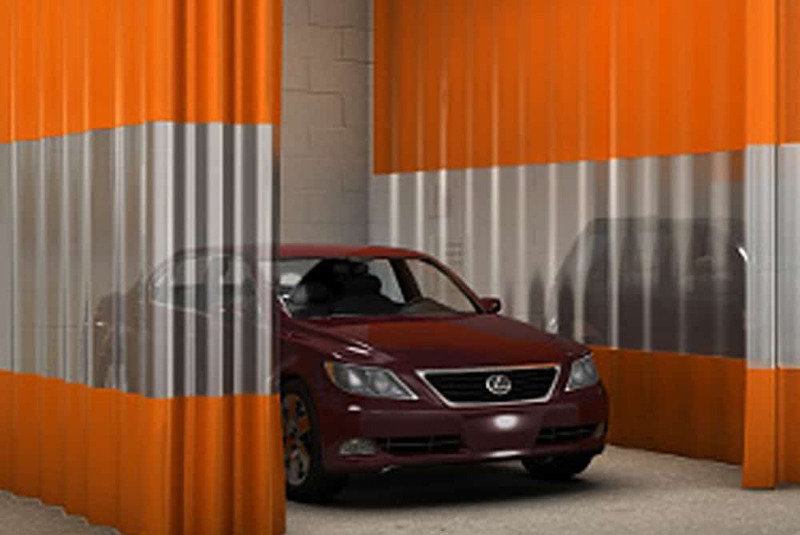 The strip door curtains allow traffic to flow as needed, but provide immediate stoppage of airflow once a vehicle or person has passed through. Easy to install and remove, there are a wide range of sizes, material thicknesses, and overlap patterns. 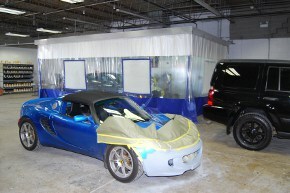 Contact AmCraft today for additional details at 847-439-4565 or email us at sales@amcraftonline.com! Our technical specialists are ready to answer your questions. Give us a call today so that we can furnish you with competitive curtain installation quotes! ©2019 AmCraft Industrial Curtain Wall. All rights reserved.